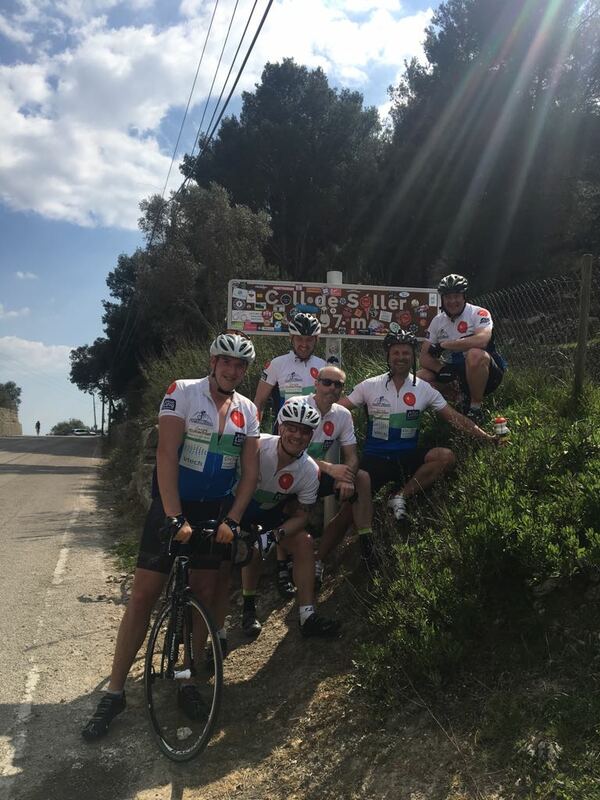 A 06:00am start on Saturday 1st July saw five of the Peaky Climbers set off on a 102 mile training ride around the Oxfordshire countryside. Macca, Nobby, Cricky, Ben & John set off from Denchworth towards Cumnor, Oxford along the country lanes parallel to the A420, dropping down to Farmoor Reservoir and onto Enysham, where John B branched off to head to Enstone airport to catch a flight to the Festival of Speed in Goodwood. Down to four the boys peddled on relentlessly to Letchlade via Stanlake, Bampton & Clanfield before climbing up to Bradbury Clumps then descending down into Farringdon. 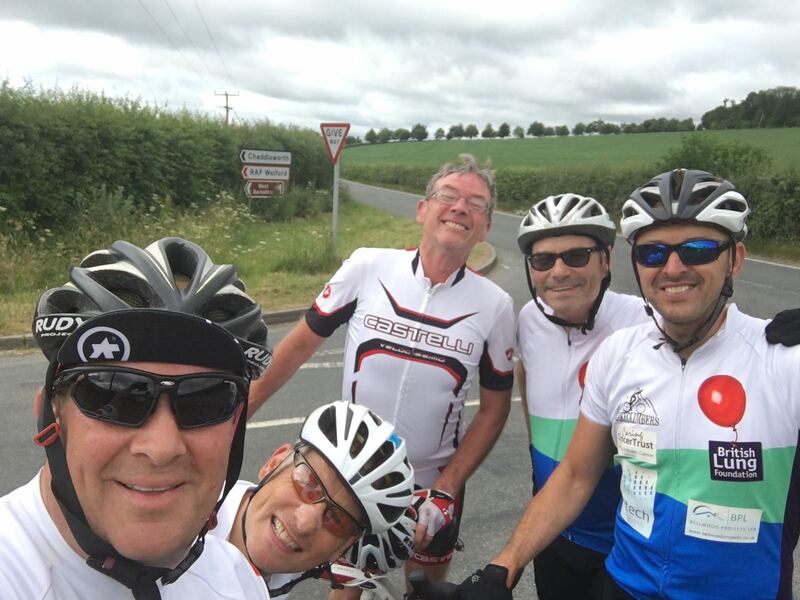 The pace then quicked as the Peakies finally got a tail wind and were soon in Fernham where they were met by the new Peakie, Graham Cherrill who had cycled over from Reading to join in the Team ride. The scheduled 51 mile café stop was welcomed as the sunny morning temperature began to rise and the venue of Bloomfields café went down well with the Peakies, great coffee, cakes and Crickys homemade Salmon quiche ! Back on the road refreshed the Team meandered towards the Ridgeway and up & over Ashbury Hill, where at the top Ben departed to return to Denchworth to prepare for the village Fete in his role as Chairman. Back down to four again the lads whilst shooting down towards Lambourn came across a stray dog in the road which had been caught by a passing motorist. The Peakies agreed to take responsibility for the re-uniting of the gorgeous Spaniel with its owners and followed the car into Lambourn. The dog was then watered, temporary lead made from string, walked around the square to check for injury, kook to the local equine vets before finally being rehomed on a farm via door to door knocking. The hour delay for Pet Rescue had now hampered the Peakies plans (route reduced to 90 miles) but undeterred the lads pushed on towards Great Shefford and then climbed back to the top of the Ridgeway, Manor Hill and descended into Letcombe Regis. Sincombe Hill was met with encouraging ease and then a final speedy finish through Childrey and home. A great team ride, with the added success of returning a pooch to his owners! Next week…Preparation for The Alps!! !